There are quite a few things you should take into consideration. To ensure that you do the right things at the scene, check out the Dos and Don´ts at the scene of the accident. 1. Above all, do not leave the scene of the accident. “Hit and Run” is a serious criminal offence. If you leave the scene of an accident, your insurance company may deny you coverage. 2. Take necessary emergency steps. If someone is injured, call for medical assistance and make sure that oncoming traffic is warned by placing a warning triangle 100 meters from the scene of the accident. Use your first-aid kit if needed. If the accident occurs on an U.S. Installation or casern, call the military police immediately. If the accident occurs off an U.S. Installation, you must notify the German police, who may or may not respond to non-injury accidents (You must report accidents that occur off U.S. Installations to the military police within 72 hours. This will help you later if you have to appear in court and when your insurance company needs information). Whether or not the police respond, be sure to take all steps described in the next paragraph. 4. Get information from the other drivers involved in the accident. Get the name, nationality, age, license number, vehicle registration number and the name and address of the insurance company of other drivers involved. Give other drivers the same information about you. Get names and addresses of witnesses, especially those who may testify in your favour. 5. 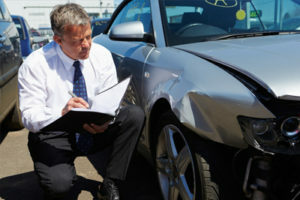 Write down the facts surrounding the accident. Draw a diagram of the position of vehicles involved, the direction vehicles were travelling, point of impact, and any other relevant information, such as position of traffic signs and signals near the scene. If a camera is handy, take pictures of the accident scene and of vehicle damages. 6. Cooperate with the police, but be careful what you say. Cooperate fully with civilian and military police. The police report may be important later as evidence in determining fault. Give yourself time to formulate answers to police questions: If you are not careful, you may say something that could be used against you later. Cases have occurred, for example, in which comments such as “I am sorry this happened” have been used in court as an admission of guilt. Include in your description of “What Happened” road conditions, time of day, weather conditions, what property may have been damaged, injuries… anything and everything that pertains to the incident. Check out our Loyalty Repair Program that will provide you – in case agreed with us – with a rental car free of charge. Assistance will be given to you from Monday to Friday, 9:00 – 17:00 h.
This is a letter from your lien holder/bank authorizing the insurance company to pay the garage doing your repairs directly, and where to send payment (preferably a German address and bank account where possible) in the event your vehicle is deemed a “total loss”. This letter is required by German law. After you have submitted your claim online, you will receive a copy of the claim form. Your local agent will inform you about further claim processing. If you experience any problems filling in the claims form, just print it, complete it by hand and fax it to +49 221 925488-978. If you need ROADSIDE ASSISTANCE in Germany, please call 0800 CARCLAIM (toll free). Calls from outside of Germany, please dial +49 221 925488-79.